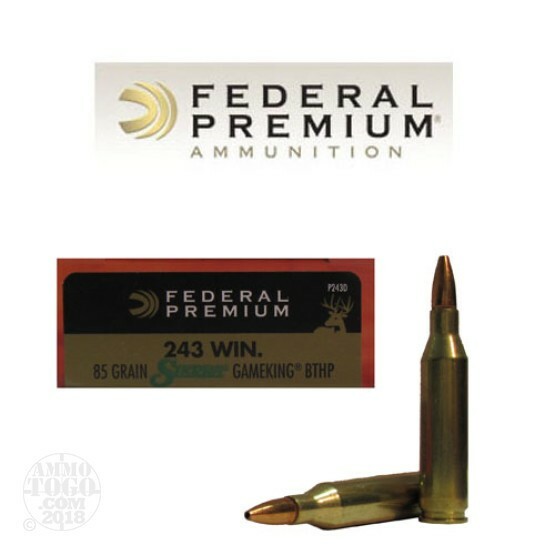 This is .243 Win Federal Vital-Shok 85gr. Sierra Gameking Boat Tail Hollow Point Ammo. Federal Vital-Shok ammunition is designed for maximum performance and reliability. These premium hunting bullets are matched with select powders, primers, and brass to create a reliable, hard hitting hunting cartridge. This is new production ammo, non-corrosive, in boxer primed, with reloadable brass. This ammo comes packed in 20 round boxes.